For the better part of the last fifteen years, Victory Records has been one of the most influential independent labels in alternative music. Though the quality of their current roster is open for debate, there was a time in the not too distant past where seemingly every band who signed with the Chicago based record label would end up either headlining Warped Tour or appearing on the cover of Alternative Press Magazine, if not both. Taking Back Sunday, Hawthorne Heights, Silverstein, Bayside, Between the Buried and Me, and Thursday all have Victory to thank for establishing their brands in the world of music, as do the members of slightly smaller groups like Aiden, Spitalfield, and The Audition, but what about the great bands who joined the label and never went anywhere? I have loved many bands and labels in my life, but there was time in the mid-2000s where I was legitimately obsessed with Victory Records. In fact, if you traveled to my parents’ home in southwest Michigan today you would still find a case of CDs marked ‘Victory’ that contains roughly one-hundred releases from the label, all in alphabetical order. I listened to every album that Tony Brummel and his staff pushed out, regardless of genre, and looking back now it’s probably because of this willingness to blindly accept whatever artist Victory deemed noteworthy that I developed my love for all music. In my mind, if it was part of Victory, it was worth your time. As I grew older and began studying business in college, it became clear to me that not every artist who had carried the Victory banner above their logo ended up becoming a household name. Despite the quality of some releases, there were several artists who never really fit in with the rest of the roster and, for one reason or another, failed to reach the heights of popularity experienced by their label brethren. I like to think I did everything in my power to help these acts along, including attending shows whenever possible and covering their promotional campaigns at length on my music blog, but even my best efforts were never enough to help certain artists ‘break out’ the way I felt they deserved. While speaking with a career-long industry friend a few months back, I began revisiting many of those same under-the-radar acts and questioning what became of their various members. For the most part, a lot of those groups eventually accepted that they would never reach a point of sustainability and decided to call it quits, or at the very least go on a long-standing hiatus. One or two are still around, but even their careers have never reached the level of exposure once believed to be inevitable for a Victory artist. I admire their commitment to their craft, but I often wonder if they hold any grudges towards the label or regrets over that initial decision to sign. Those are answers I may never have, but as long as streaming services exist and Victory pays to keep their catalog in rotation I will be able to experience the incredible music they created all those years ago. I understand that the vast majority of music discovery pieces written these days are about new material that almost no one has heard, but today I want to switch things up and share some older songs that you probably never heard before today. The bands who recorded these songs have almost all broken up, but like with any form of art, the things they created while together remain available for the world to enjoy. These songs may change your life, but even if they don’t I think you might walk away with a new obsession or two worth revisiting in the months ahead. All I ask is that you give them an honest chance to impress you, and if you like what you hear that you find a way to let the people who created it know you enjoyed their art. All artists deserve to know their work will live on after their time in the spotlight has faded, especially those who never get the chance to shine as bright as they could have if things worked out differently. Of all the bands to be on Victory Records and never get the recognition they deserved, The Forecast are perhaps the only group to make it out of their contract alive with all original members still on good terms. Hailing from the most rural part of Illinois, this criminally underrated band blended elements of folk and western music with their two-vocalist approach to rock in order to create something wholly unique. They released two full-length records during their time with Victory, including the essentially flawless Standing In The Shadows Of Two Gunmen, but neither sold more than a few thousands copies when all was said and done. They released more music after leaving the label, but only through smaller deals with tiny distribution. 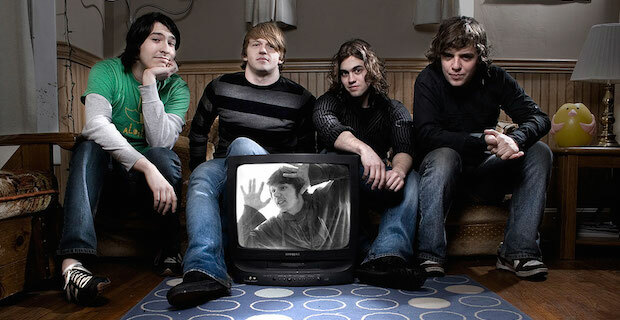 For a brief period of time, I really believed The Junior Varsity would be the next great indie crossover sensation. Their debut album, Wide Eyed, was an album unlike anything Victory – or the rest of alternative music – had released up to that point. It was a hypnotic and experimental effort, which brought to light the struggles of growing up in a post-Y2K world as experienced through the eyes of frontman Asa Dawson. The group found a lot of success early on, but after the 2007 release of their third album, Cinematographic, things more or less fizzled out. The group reunited briefly in 2010, but they never produced another album. Picking one single to share from the band was difficult, so I went ahead and chose two. It’s my list and I can do what I want, right? Perhaps the strangest acquisition by Victory in the mid-2000s, Moros Eros were an experimental indie band with a love for extremely long titles. Their label debut, I Saw The Devil Last Night And Now The Sun Shines Bright, ushered in a new wave of hype and attention for the label from sites that had largely ignored their rise to dominance in the modern emo movement. They were the label’s ‘Pitchfork-ready’ group, for lack of a better explanation, and they thrived in tiny clubs and basement shows until their breakup in April 2008. I still stumble whenever I attempt to define their sound to someone who has experienced their work, but that’s only because it defies basic categorization. Like every artist on this list, Moros Eros tried something different. It worked, but not on the same level as their label peers, and before long they were underdogs fighting for even the smallest of mentions in the press. There have been a few artists and groups who chose to use years as their name, but the only one I have listened to more than a handful of times in my entire life is the indie collective known as 1997. Hailing from Chicago, the same street which Victory still claims to run, this group delivered a number of pop-laden indie gems between 2007 and 2009 that would still have a decent shot at college radio play if released today. It’s a complete 180 from the rest of the Victory roster, including comparison between them and other artists on this list, but for whatever reason, labelhead Tony Brummel welcomed them into the fold only a short time after they formed in 2005. Their lineup changed with almost every tour, which certainly did not help their chances at longevity, but whenever the time came to record, the members involved would find a way to create something special. Around the time The Junior Varsity began making waves in music, Victory also signed a pop-tinged regional act known as June. This group, which would only release two albums before calling it quits in 2008, hailed from the midwest with a sound that fell perfectly in line with then genre headliners The Academy Is. June never reached the same heights of fame as TAI, of course, but for a short while it seemed like they were only one big scene hit away from doing so. I’ve included their biggest hit here, as well as a song that I have revisited at least a dozen times in the last year alone. The band is technically still on ‘hiatus,’ but I sincerely doubt we will see a day when they return. From the same small town as Asa Dawson of Junior Varsity. I taught elementary classes when he was in high school My fourth graders idolized him. He played the drums and was a good role model. They were taken to another world when they got to watch him play.